As we saw when looking at the July Days the Bolsheviks were able to survive the post-July repression because of their firm roots within the working class. However, for those looking for easy lessons for today, a warning. It has to be remembered that this would not have been worth anything if it was not for the relative strength of the Petersburg workers in their own concentrations in the Vyborg and Petrogradsky districts. This turned these areas into proletarian fortresses which could not easily be entered by the State. Added to this was the chronic weakness of the Russian bourgeoisie which had failed at every turn to overthrow Tsarism. After the February Revolution it was trying to build a state which depended entirely on the whim of the working class for its continued existence. They were only able to pretend to hold power so long as the workers did not realise where their own class interests lay which meant as long as the Mensheviks and S.R.’s still could claim an increasingly fictitious majority in the Petersburg Soviet. For the bourgeoisie the fall of the Tsar had only meant the removal of the greatest obstacle to winning the war against the German bourgeoisie. The proletariat thus facedcontinued privations throughout 1917 and could only turn to the one party which had opposed the war since its beginning. By early August when the vote for the City Dumas showed an increase in Bolshevik strength of 14% on the May figure, it was clear that the July Days had resulted only in a brief check to the Bolsheviks’ hopes. And as the Russian proletariat increasingly united itself behind the Bolshevik Party the cracks in the bourgeoisie burst wide open. The apparent defeat of the Bolsheviks in July had at first given new confidence to the bourgeoisie. Stiffer measures were introduced in the army, including the return of the death penalty, in an attempt to restore discipline. Prince Lvov yielded to the Socialist Revolutionary, Kerensky as Prime Minister, since it was felt that he alone had the support of the majority of the Soviet and the will to destroy the Bolsheviks. However, when it quickly became clear that Kerensky was only prepared to pursue Bolsheviks, and not reverse the ascendancy which the Soviets had gained since February, the old ruling class immediately began to cast around for a real Napoleon figure. Egged on by the British and French ambassadors who constantly promoted the cause of General Kornilov, the party of the Russian bourgeoisie, the Constitutional Democrats (known as the Kadets) now threw its weight behind a military dictatorship. 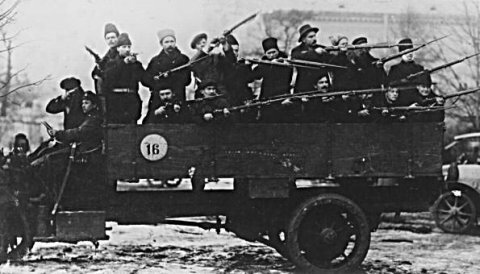 Capitalists formed a “Society for the Economic Recovery of Russia” aimed at financing the Kadet’s plans, and, as if to underline the change in the tactics of the bourgeoisie, the Kadets opened their ranks to the semi-fascist ex-members of the Tsarist Black Hundreds, who were famous for their pogroms of Jews and workers under Nicholas II. Kornilov, whose views are similar to those of the Provisional Government, is the man to save the situation. Once Kornilov was appointed the active scheme against the revolution gathered pace. Riga was deliberately yielded to the Germans in order to bring Petersburg within the front line zone and therefore under military rule and this signalled the start of the crisis. We leave to bourgeois historians the task of analysing the degree of Kerensky’s complicity in the early moves in the Kornilov affair. Our task is to look at the very significant turning point in the consciousness of the proletariat which came about as a result of Kornilov’s actions. To illustrate the difference let us quote at length from the only Western historian to have had real access to Russian archives. In previous crises, in April, June and July, the spontaneous initiatives of Bolshevik and anarchist soldiers had caused street demonstrations. The leading elements in the Bolshevik Party had been forced, in the end, to assume responsibility for a movement launched by the young men of the military organisation. As the cinema films show, there were considerably fewer workers than soldiers or sailors. The people were mentally prepared, and the means for defence were made available, such that when the organisations appealed, every citizen, tree, house and stone was set to oppose the advance of Kornilov, whose telegrams failed to arrive and whose locomotives got no water. The ground crumbled under his feet. We make no apology for quoting this passage at length. First it reveals a new step forward in the consciousness and organisation of the working class. No longer is the running made by impetuous sailors but by the carefully considered actions of greater masses of workers. Resistance to Kornilov also sees the arming of the working class on a wide scale for the first time. It is now that the Red Guards link up with the soldiers of the Petersburg garrison and it is also at this time that tolerance of the antics of Kerensky and the Mensheviks and S.R.’s in the Soviet comes to be replaced by greater suspicion. The committee, making defence preparations, had to mobilise the worker-soldier masses. But the masses in so far as they were organised, were organised by the Bolsheviks and followed them. At that time theirs was the only organisation that was large, welded together by an elementary discipline and linked with the democratic lowest levels of the capital. Without it the committee was impotent. The Russian Revolution 1917, p. 505. Lenin, who was still in hiding in Finland, was taken more by surprise than the other Bolshevik leaders. This was because he recognised that the failure of July had given the bourgeoisie the opportunity to roll back the revolution towards a military dictatorship. However, he assumed that the bourgeoisie had found their dictator in Kerensky and that though he was only a caricature of a Bonaparte he would probably survive for some time. He was clear however that Kerensky would not last. The Russian Bonapartism of 1917 differs from the beginnings of French Bonapartism in 1799 and 1849 in several respects, such as the fact that not a single task of the revolution has been accomplished here. Foremost amongst these tasks was the settling of the land and war questions. Even though Chernov, the leader of the Social Revolutionaries, the supposed peasant party, was Minister of Agriculture, the land seizures of the peasants were resisted by force because the Provisional Government and its Soviet allies had no wish to break with the bourgeoisie and landowners. The latter were demonstrating their gratitude for this by looking for a general to sweep aside the Soviets. This is why they committed political suicide by opting for the Kornilov adventure. It was this that caught Lenin by surprise. Once he saw what had happened he had no hesitation in supporting the actions of the Bolsheviks in Petersburg. Indeed this episode rather undermines the picture given by both bourgeois and Stalinist historians (as well as a few Trotskyist writers like Tony Cliff) that without Lenin the Bolshevik Party was incapable of acting. In this case Lenin’s contribution was to frame the proletarian response to a dilemma which an event like the Kornilov Affair poses for the proletariat. The Kornilov revolt is a ... downright unbelievably sharp turn in events. Like every sharp turn, it calls for a revision and a change of tactics. And, as with every revision, we must be extra cautious not to become unprincipled. It is my conviction that those who become unprincipled are people who (like Volodarsky) slide into defencism or (like other Bolsheviks) into a bloc with the S.R.‘s into supporting the Provisional Government. Their attitude is absolutely wrong and unprincipled. Even now we must not support Kerensky’s government. This is unprincipled. We will be asked: aren’t we going to fight against Kornilov? Of course we must! But this is not the same thing; there is a dividing line here, which is being stepped over by some Bolsheviks who fall into compromise and allow themselves to be carried away by the course of events. Lenin quickly added a footnote congratulating the Bolsheviks in Petersburg on having already carried out the policy he was advocating However, the stance taken by the Bolsheviks needs some discussion if we are to explain its real significance, particularly since the tactic adopted have been used on numerous occasions since by those who claim to be proletarian to justify opportunist and counterrevolutionary positions. The tactics adopted by the Bolsheviks during the Kornilov Affair have often been cited as the precursor for the united front of 1921 or the anti-fascist slogans of the 1930’s. However, as Lenin (and Marx) often pointed out, the key to any understanding of political action to locate it within its specific historical context. If we do this we can see we the last two are expressions of defeat for the working class whilst the former was correct because it was put together in an entirely different situation. In August and September the Petersburg masses were already moving forward in a confident fashion, as the quotation from Ferro above shows. In this context it was possible for the Bolsheviks to fight alongside the Mensheviks and S.Rs but without compromising their political independence. Not to have acted thus would have been to turn their backs on an opportunity to demonstrate their capacity and resolution in practice. In 1921 and in the 1930’s the tactic of the united front and the anti-fascist alliance were totally different because they took place in a situation when the working class was in retreat. The net result of these policies was to legitimise the forces of social democracy as proletarian (whereas the Kornilov Affair was dragging these forces further towards revolution than they wanted), and to associate the defence of the workers’ interests with the defence of capitalist democracy. In the Kornilov Affair the defence of Petersburg took place under the aegis of the workers’ own organs: the Soviets, so there was no danger that the defenders of capitalist democracy would gain from it. Indeed the logic of the Kornilov Affair was for the Soviets to take over from the Provisional Government immediately to prevent any further plotting by Kerensky and the Right. The soviets, now distinctly radical in outlook, emerged from the crisis with their popularity amongst the masses immensely enhanced. Revolutionary Russia was more widely saturated that ever before with competing grassroots political organisations and revolutionary committees. Workers had become more militant and better organized, and significant numbers of them had obtained weapons. At the same time, democratic committees in the army, by virtue of their leading role in organizing soldiers against the Kornilov movement, were rejuvenated. Within the Petrograd garrison, control of many regimental committees passed from more moderate elements into the hands of the Bolsheviks. Lenin at this point again raised the possibility that there could still be a peaceful development of the revolution if the Mensheviks and S.Rs would allow the soviets to take power. By seizing full power the soviets could still today – and this is probably their last chance – insure the peaceful development of the revolution, peaceful election of deputies by the people and a peaceful struggle of parties inside the soviets. Lenin also spelled out why soviet power would be fundamentally different to the other governments that had appeared in 1917. The slogan “Power to the Soviets”, however is very often, if not in most cases, taken quite incorrectly to mean a “Cabinet of the parties of the Soviet majority”... “Power to the Soviets” means radically reshaping the entire state apparatus which hampers everything democratic ... the organised and armed majority of the people - the workers, soldiers and peasants. It means allowing the majority of the people initiative and independence, not only in the election of deputies, but also in state administration, in effecting reforms and various other changes. was the evidence of a very large-scale movement which came from the depths of society. At the same time the lack of revolutionary will on the part of the Mensheviks and the S.Rs saw the break-up of their organizations. Whilst a split in the S.Rs resulted in the formation of the Left S.Rs who generally acted with the Bolsheviks, the Mensheviks became a rump as many delegates flooded into the ranks of the Bolsheviks. However this did not automatically mean victory for the proletariat. Soviet power could not come about by making speeches or passing resolutions about it. First the old order would have to be pushed aside and for this the proletariat would have to find its instrument. It found it in the Bolshevik Party.